How-To Build a Cable Management System for Under a Dollar! This afternoon I couldn’t believe my eyes when I clicked on a link from @mattcutts and saw something so simple I couldn’t believe no one has thought of it before. The concept is very simple. 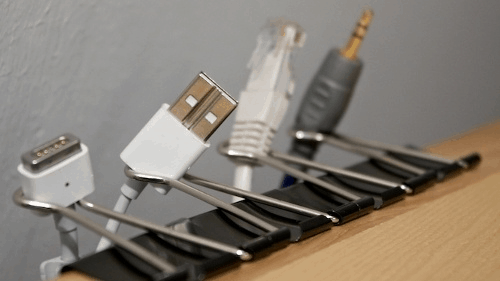 Just stick a few Binding Clips on the edge of your desk for the perfect almost free cable management system. The photo was so great that I felt I just had to share it with all you groovyReaders. Enjoy! Lol nice. I saw this on lifehacker yesterday also. It’s a great concept. Just 1 problem… All my binding clips are to small. My desk is a bit to thick. Yeah, these are my favorite. Simple but effective. Fortunatly for me the clips fit on my desk. I’m good to go (but still have a nightmare cable mess UNDER my desk). Normally I fix that with zip ties but i’ve been lazy with this last PC i built.